Pledge for Life campaign, which aims at saving children from tobacco, has been initiated in Assam on Friday. The campaign started in three universities at Dibrugarh, Silchar and Guwahati. The Pledge for Life campaign aims at preventing children from initiating the use of tobacco. The National Service Scheme (NSS) in Assam has more than two lakh volunteers. A ‘Pledge For Life’ project in collaboration with the NSS was launched in Guwahati. Under this project several activities like sensitization, debates, poster competitions and rallies will be conducted to create awareness among college students. During the 7-day camp, one day will be devoted exclusively to tobacco control. Two nodal students will be appointed in each NSS unit to monitor the activities. After the pilot in these three universities, it will be rolled out to other colleges in the state of Assam. 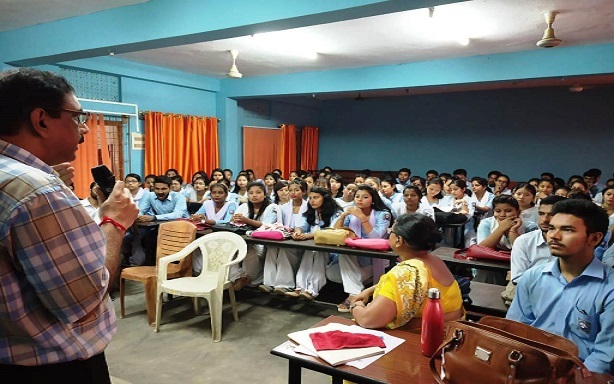 A very fruitful interaction with the college students and NSS volunteers of Dispur College and Dakshin Kamrup Girls College took place on Friday. Team from Sambandh brought to notice of students the epidemic of tobacco in Assam and India. Students were shocked to learn that tobacco harms every organ of the body and leaves families devastated with the suffering. Students came forward during the discussion and gave ideas to prevent themselves and next generation from this deadly product.